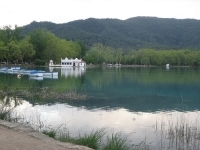 The historic lakeside town of Banyoles, just north of Girona, is well known for hosting international rowing events, but it is also a fun, attractive and interesting place to visit and perhaps work off some energy in a pedal-boat or on a bicycle. The bright blue lake itself is the only one in the world fed by two merging subterranean rivers, the clean water flowing in at 600 litres a second. There are numerous options available to those wanting to take to the water, from a swimming dock to cruises or hire boats, and a grassy bank for sunbathers or a network of shady footpaths for those who prefer the shore. The lake is traditionally used for rowing events, and was the site of the rowing races during the 1992 Olympics. The town of Banyoles dates from 812, having grown up around a Benedictine monastery, and its old section is full of fascinating ancient buildings, including the Sant Esteve de Banyoles Monastery (around which the town was built), the Gothic Church of Santa Maria dels Turers, and the Gothic palace called the Pia Almoina. The natural history and archaeological museums are worth visiting, and all are centred around a lovely arcaded square where a traditional market has apparently been held every Wednesday since medieval times. Address: Tourist Office: 25 Passeig de la Industria.